Easy Homemade Gifts for Dad from Kids make gift giving fun. Handmade gifts kids can make are always a favorite. These handmade gifts for dad and grandpa are unique keepsakes crafts and homemade gift ideas kids can make for Father’s Day or Christmas. Invite the kids to make any one of these easy homemade gifts for dad or grandpa for Father’s Day or Christmas. This collection of gorgeous homemade gifts for dad and grandpa that kid can make are perfect for both Father’s Day and Christmas gift giving. There is nothing better than handmade gifts for dad or grandpa from the kids. Invite the kids to make any of the easy homemade gifts for dad and grandpa listed below. 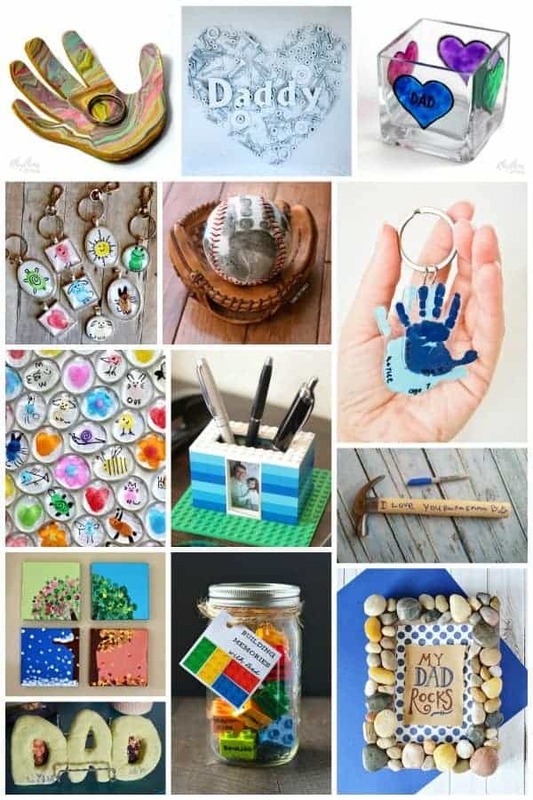 Each one makes a unique handmade gift idea. 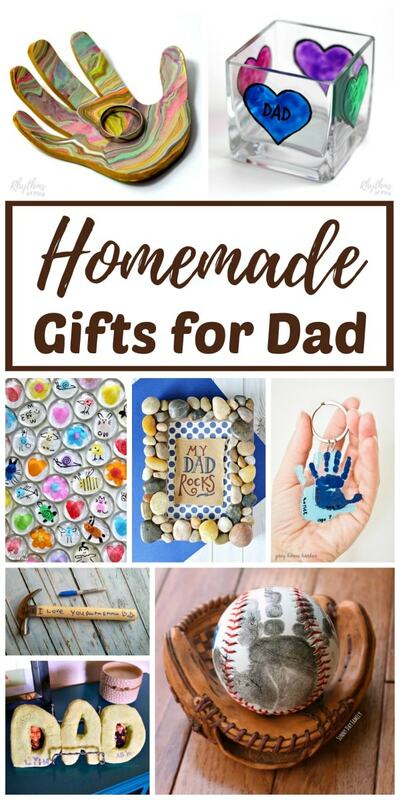 Click on the blue hyperlinked text to see the directions for each homemade gift idea for dad or grandpa. Help the kids make a handprint ring bowl for Dad. My husband rarely ever takes off his ring, but he loves the gorgeous marbled clay ring bowl sitting upon his dresser. Invite your children to make a photo remote caddy for dad or grandpa. Pop over to Teach Me Mommy for directions to this homemade gift. 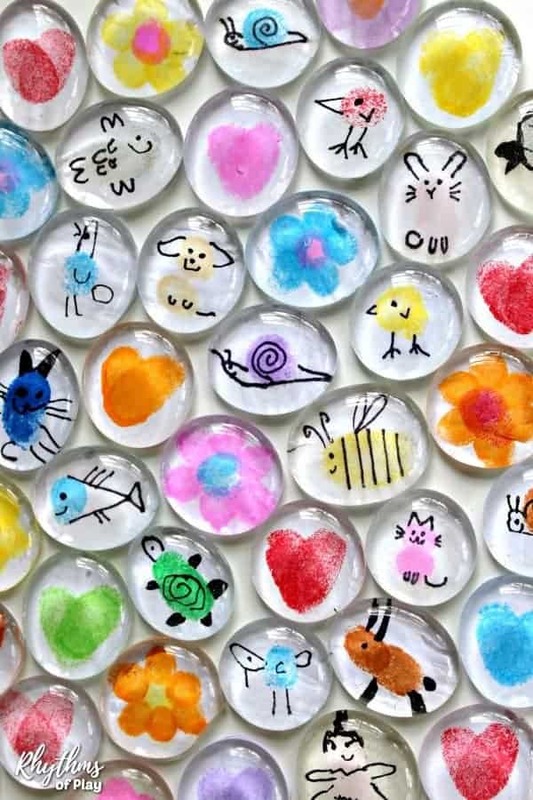 Fingerprint art glass magnets are a great way to save your child’s artwork safely inside a keepsake memento for dad or grandpa. You can even design some with dad or grandpas favorite team! Another fun way to transform art that kids make into a gift for dad is to make fingerprint art keychain charms. A handprint keychain is another easy homemade gift for dad. Pop over to Grey House Harbor for the directions to make this simple handprint craft for dad. 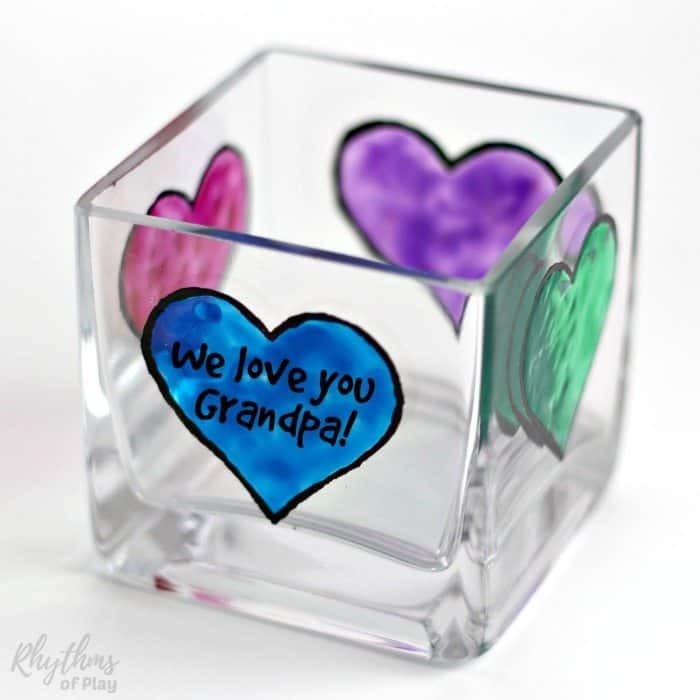 Invite the kids to paint a Personalized Candle Holder for Dad or Grandpa. Or use this easy hack to inspire the kids to make handpainted candle holders. Have your children make a “my dad rocks” or “my grandpa rocks” photo frame. Check out the tutorial on Mommy Moment to make this simple handmade gift for dad. Another homemade gift idea that is so amazing dad will want to hang up on the wall is this four-season Handprint and Fingerprint Tree. Colored golf balls are a super easy gift idea from the kids perfect for dad. Find the directions for this homemade gift over on School Time Snippets. A lego pen holder kids can make also makes a super simple gift idea for dad. Head over to LalyMom for the tutorial. 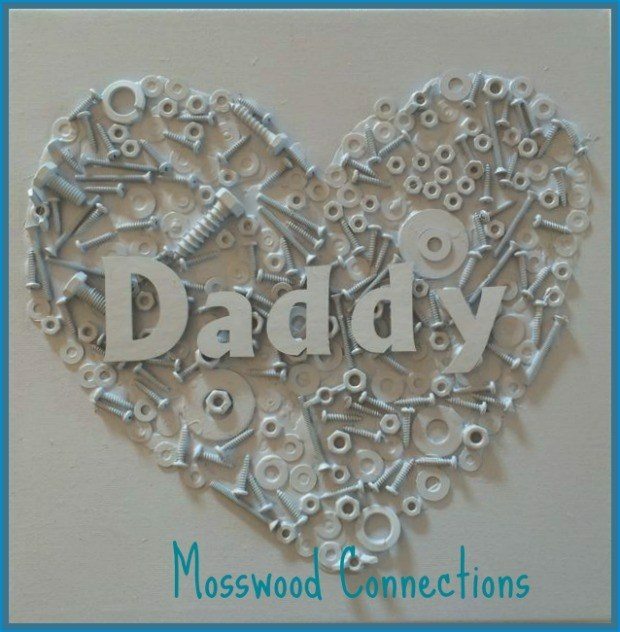 Invite your children to recycle some nuts and bolts to make a super sweet daddy heart. It would be just as easy to put grandpa or dad in the middle of it. Head over to Mosswood Connections to learn how to make this easy homemade gift idea. Use shells that the kids collect to make handmade shell frames. 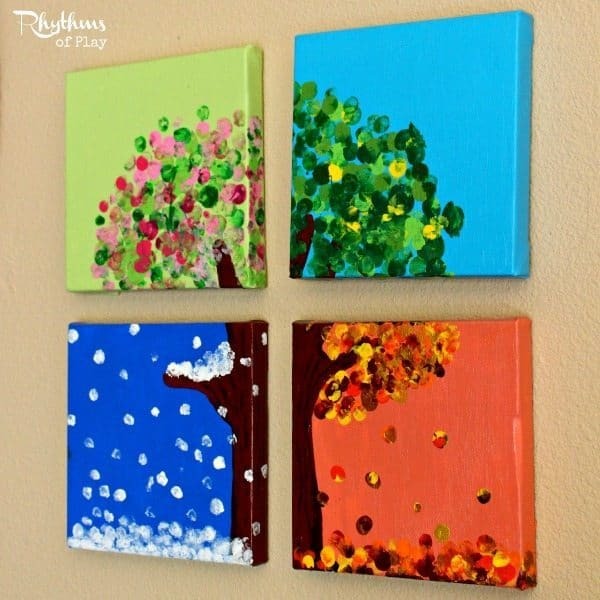 Add a handprint, footprints or photos and you have a super easy homemade gift idea from the kids. 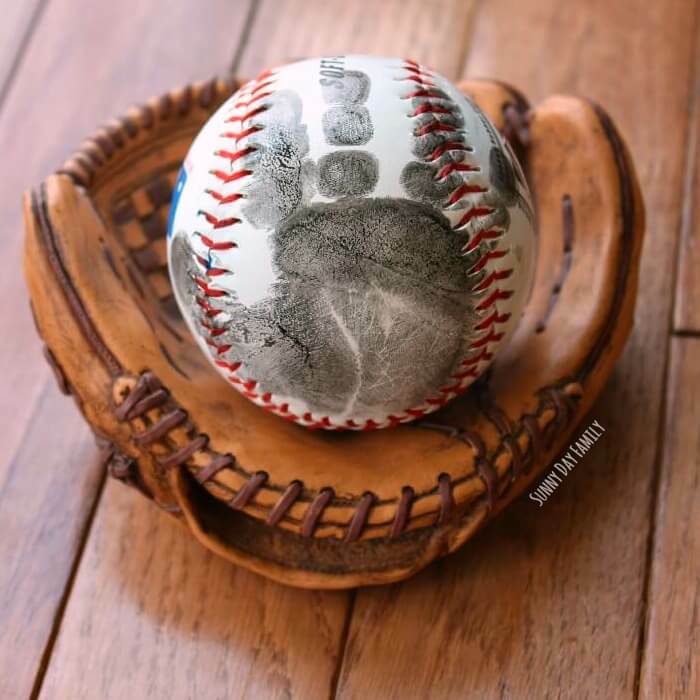 A handprint baseball with a printable poem is a unique homemade gift for dad. Check out the DIY details over on Sunny Day Family. Have the kids make a special Hammer for Dad. Hop on over to The Flying Couponer for directions to make this easy gift for dad or grandpa. 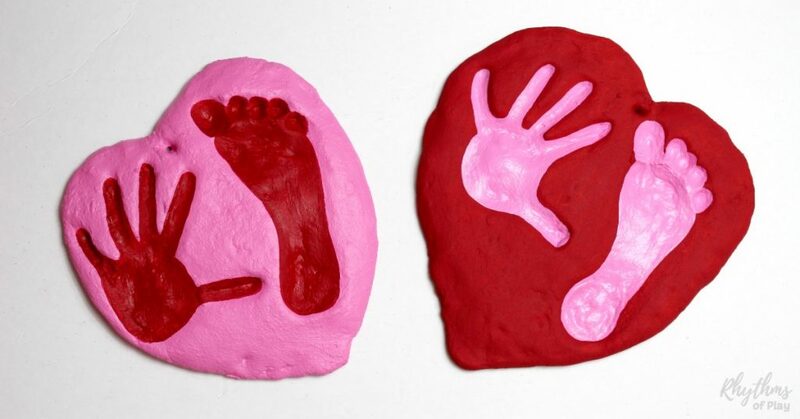 A handprint and footprint heart is another easy salt dough keepsake gift you and your children can make for dad. The handprint and footprint hearts shown below were made for Valentine’s Day. Feel free to substitute dad or grandpas favorite colors to make it special! Check out Valentine keepsake gifts that kids can make for more ideas that would be perfect for dad or grandpa. Make a “Dad” salt dough picture frame with the kids, as another super easy handmade gift idea. Check out all the DIY details over on The Soccer Mom Blog. Last, but not least, build memories with dad with this unique homemade gift idea from kids. Recycled some of your old Lego Duplo blocks with this easy gift idea for dad or grandpa. Pop on over to The Seasoned Mom for all the DIY details. 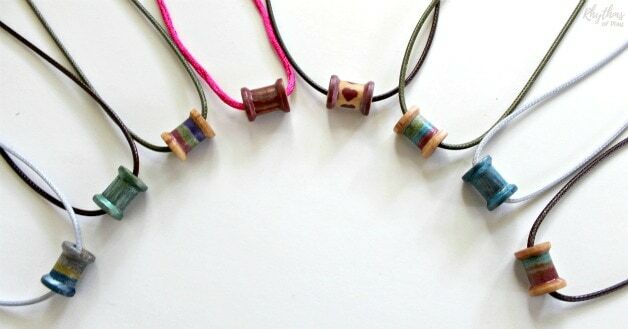 Make dad a painted wooden spool necklace with this easy jewelry making tutorial DIY. Pop on over to see how easy these necklaces and bracelets are to make and personalize with your dad’s favorite colors. You can even paint them the color of dad, or grandpas, favorite team! Handmade gifts for dad from the kids are always a favorite with parents and grandparents. We hope you have enjoyed this amazing collection of easy homemade gifts for dad and grandpa. You may also like this collection of Handmade Gift Ideas Kids Can Make, and our Ultimate Family Gift Guide. I’m so glad you like the gift ideas for Dad, Destini! I hope your dad love what you make him. My husband LOVES the gifts we make for him. Homemade gifts from children are always the best for dad!